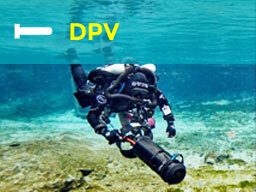 Overhead diving is without doubt one of the most challenging and rewarding forms of diving you can undertake. Hidden beneath our feet is a whole new world of mystery and wonder waiting to be discovered - the IANTD Cave Diver programs are your ticket to this magical world of underwater caves and their natural wonders. 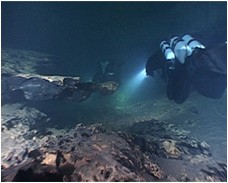 IANTD's range of Cave Diver training programs allow you to develop your skills and knowledge of Cave diving in a safe, progressive and controlled manner under the direct supervision of your IANTD Cave Instructor. The IANTD Cavern / Ltd Mine Diver program is designed to train the diver in the equipment, skills and procedures required to safely and competently dive in the overhead environment of a cavern / mine. The IANTD Cavern / Ltd Mine Diver program trains the diver in the basic skills needed to safely dive in an overhead environment. The main focus points of the program require equipment configuration, line drills and use of line reels and developing self sufficiency and safety through skills development. 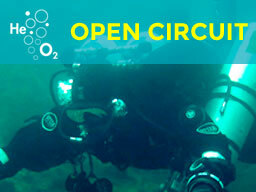 Must be a qualified as an Advanced Open Water Diver or equivalent. Must provide proof of a minimum of 10 dives. IANTD Cavern / Ltd Mine Diver Student Kit. A dual-outlet cylinder is recommended. A 1 metre long hose is required - a 2 metre long hose is recommended. A primary reel and/or safety reel. For Sport Divers looking for an introduction to the world of cave diving, the IANTD Introductory Cave Diver program is the perfect place to start. 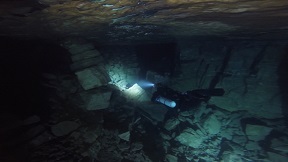 The IANTD Introductory Cave Diver program is designed to develop the divers' skills to allow diving beyond the cavern zone of cave overhead environment. It introduces the diver to self sufficiency skills utilising isolation manifold twin sets and dual outlet cylinders, line following, line laying and emergency procedures. 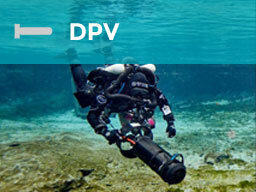 The program can be run as a continuous course in conjunction with the IANTD Cavern Diver program. 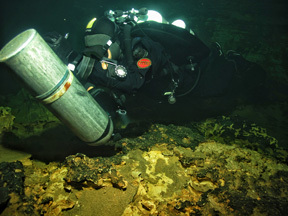 IANTD Introductory Cave Divers are qualified to dive on the main line of caves within the safe limits of their gas supply. Divers trained in the use of doubles are qualified to use them within the cave environment providing the rule of 1/6ths is strictly adhered to. CCR divers are trained to the range of a 4 litre bailout. 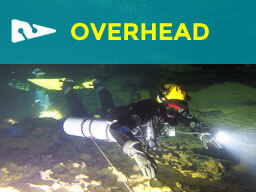 Must be qualified as an IANTD Overhead Environment Diver or equivalent. Must provide proof of a minimum of 25 logged dives or sufficient experience. All bottom mix tanks must be equipped with dual-outlet (H or Y) valves or double tanks, which may be either side-mounted or with dual orifice manifold. A 1.5 - 2 metre long hose must be attached to one second stage on the primary gas supply. One primary light and two backup lights. The IANTD Full Cave / Mine Diver program is designed to take the diver through all training necessary to plan and conduct dives in the Cave / Mine diving environment. 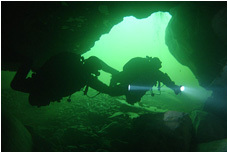 Throughout the program, the emphasis is placed on developing the diver's equipment configuration, buoyancy control and propulsion techniques to enable safe and efficient cave dives to be made. Line following, line laying and use of reels are covered extensively as are safety skills such as gas shares and light failure drills. A major part of the course is the development of team diving procedures and communication. 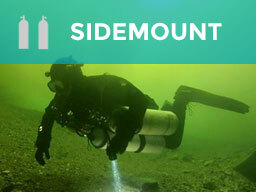 Must be qualified as an IANTD Introductory Cave Diver or equivalent. If not, must have proof of 100 dives or sufficient experience doing technical dives to satisfy the instructor that the student has the ability and knowledge to continue into this level of training. IANTD Cave / Mine Diver Student Kit. Two primary reels and a safety reel. Three line arrows and three non-directional markers. 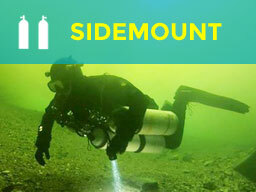 The course extends the cave divers cave penetration capabilities by the use of staging multiple cylinders throughout the planned inward swim. The emphasis is on gas management planning and emergency procedures. 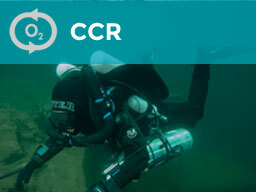 Have a minimum of 25 logged cave dives. Suitably rigged stage cylinder and regulator with SPG for each cylinder/regulator combo.